FRANKFURT AM MAIN — German Chancellor Angela Merkel’s coalition government on Sunday suffered a beating in a second key regional election in as many weeks, multiplying questions over the future of the veteran leader’s fragile alliance. Weakened by a strong backlash against immigration after allowing over a million people into Germany since 2015, Merkel’s fourth government has staggered from one crisis to the next since being formed earlier this year. According to an exit poll by public broadcaster ARD in Hesse state, Merkel’s Christian Democratic Union (CDU) shed more than 10 points compared with 2013 for a 27.4-per cent score, holding on to a weakened first place. 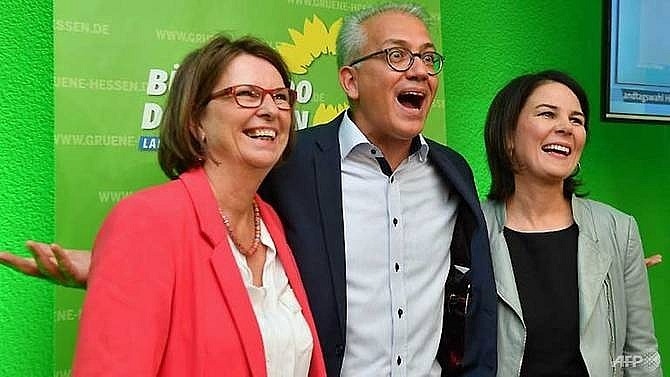 Meanwhile junior federal coalition partners the Social Democrats (SPD) tumbled more than 11 points to 19.6, roughly tied for second place with the ecologist Greens, who almost doubled their result to 19.5 per cent. Both the SPD and Merkel’s CSU sister party had also seen grave losses in Bavaria’s regional poll earlier this month. "It’s very painful for the CDU that we’ve lost many votes," party general secretary Annegret Kramp-Karrenbauer -- widely seen as Merkel’s anointed successor -- acknowledged at a Berlin press conference. The result is another milestone in the long decline of the big-tent "people’s parties" CDU and SPD that have dominated German politics for decades. Electoral momentum is on the side of newer parties, more tightly focused on a narrow range of issues. Propelled by the backlash to Merkel’s migration policy into the German federal parliament last year, the anti-immigrant Alternative for Germany (AfD) is now also represented in all 16 state legislatures, after Hessian voters handed it a 13-per cent score and fourth place. The protest party has eaten into both the CDU and SPD vote by railing against migrants and refugees as well as uncaring Berlin elites. The chancellor is weakened after three years of battling over her open borders decision. While migration and asylum policy has been sharply tightened since, it has not been enough to stop desertions to the AfD and disquiet in the CDU’s own ranks. The Greens meanwhile are attracting voters who favour welcoming refugees, worry about climate change or are fed up with the indulging of car companies during a years-long scandal over harmful emissions from diesel vehicles. After 13 years with Merkel at the helm, most of them in coalition with the SPD, many Germans are tired of government by carefully-crafted compromise, calling instead for clear direction on pressing issues like migration, security, reform of the European Union and climate change. Nor did the veteran leader’s fourth government get off to a good start after its formation earlier this year, with two rows over relatively minor points bringing it to the brink of collapse in the summer. "The situation for Merkel is grave," daily Sueddeutsche Zeitung judged late Sunday. "Now the question is whether we’ll soon have to write ’in liquidation’ after her coalition. And who would then be the insolvency administrator?" While the internal battles in her government have mostly been sparked between the CDU and the more conservative CSU, the Social Democrats have ended up footing a costlier bill in lost votes. The SPD has suffered a string of regional defeats and last year’s worst national election score since the founding of the Federal Republic in 1949. "The state of the government is unacceptable," party general secretary Andrea Nahles said on Sunday. Berlin must find a "reasonable way of working", Nahles said, arguing that the dismal picture the two parties were painting in the capital had "significantly" contributed to the regional election blow. The CDU must now agree to a "clear, binding roadmap for politics in the interest of the citizens," she demanded, ahead of a previously-agreed "half-time review" next September. "Then we’ll be able to check whether this government is still the right place for us," Nahles said -- implying the SPD may quit if Merkel does not offer new concessions.